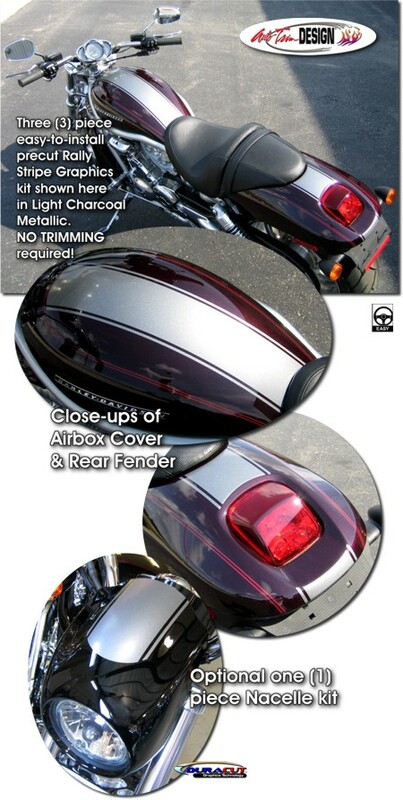 Set your Harley-Davidson VRSC apart from the rest with this tough looking Rally Stripe Graphics kit. Easy-to-install kit is packaged as a set of PRECUT pieces (one  piece Nacelle shell graphic is also included in the kit), ready to install, in a wide variety of colors - NO TRIMMING required. Stripe package is not just a set of 4.5" (11.43cm) strips in a box. Kit consists of prefitted, tapered and contoured pieces that feature a 0.1875" (4.76mm) pinstripe at each side as shown. Kits are available to fit specific VRSC models as noted in chart below. Includes easy-to-follow general online instructions. * Slight trimming may be required due to minor changes in model rear fender shape. One (1) piece Nacelle graphic is included in all kits shown above. If your bike does not have a Nacelle headlight shell, simply do not use the piece.